NOTICE: Requires the base game Borderlands: The Pre-Sequel in order to play. Activation key must be used on a valid Steam account, requires internet connection. If you own the Borderlands: The Pre-Sequel Season Pass, DO NOT purchase this content here as you will be charged again. ABOUT THE GAME	Handsome Jack’s found something ludicrously powerful within CL4P-TP’s mind. Never one to tur… n down more power, Handsome Jack digitizes the vault hunters and sends them into Claptrap’s mind. The goal is simple: find the mysterious “H-Source” code and get out of Claptrap’s consciousness without going insane. 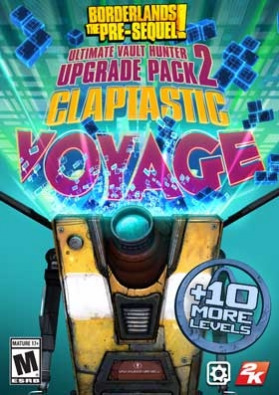 In the first full campaign add-on for Borderlands: The Pre-Sequel , our anti-heroes will deal with Claptrap’s personal insecurities, malware, and digital representations of his crushing loneliness! As bonus content, this pack also includes Ultimate Vault Hunter Upgrade Pack 2, which raises the level cap and gives your characters 10 new levels plus 10 new skill points to earn!SYSTEM REQUIREMENTS Minimum OS: Windows XP SP3, SOFTWARE: Steam Client Processor: 2.4 GHz Dual Core Processor Memory: 2048 MB/2048 MB Vista Video memory: 256 MB VRAM, DirectX 9 Video card: NVIDIA GeForce 8500 / ATI Radeon HD 2600 Sound card: DirectX 9 Compliant Recommended OS: Windows XP SP3/Vista/Win 7/Win 8, SOFTWARE: Steam Client Processor: 2.3 GHz Quad Core processor Memory: 2048 MB/2048 MB Vista HARD DRIVE: 20 GB free Video memory: 512MB VRAM, DirectX 10 Video card: NVIDIA GeForce GTX 560 / ATI Radeon HD 5850 Sound card: DirectX 9.0 c Compliant Other Requirements & Supports: Initial installation requires one time internet connection for Steam authentication; software installations required (included with the game) include Steam Client, directX 9, Microsoft .NET 4 Framework, Visual C++ Redistributable 2005, Visual C++ Redistributable 2008, Visual C++ Redistributable 2010, and AMD CPU Drivers (XP Only/AMD Only). Windows Imaging Component (Windows XP 64-Bit only) Internet connection and acceptance of Steam™ Subscriber Agreement required for activation. See www.steampowered.com/agreement for details. © 2014 IPerion, LLC. Published and distributed by 2K. Gearbox and Borderlands, and the Gearbox Software and Borderlands logos, are registered trademarks, The Pre-Sequel is a trademark, all used courtesy of Gearbox Software, LLC. 2K, 2K Australia, and their respective logos are trademarks of Take-Two Interactive Software, Inc. All other trademarks are property of their respective owners. All rights reserved.